Everest Gokyo Cho La Pass Trek package is utmost walking/hiking trail in Everest region of Khumbu Himalaya Nepal. Early morning scenic flight from Kathmandu to Lukla and you will start your trek walking through colorful Sherpa village, Gompa, Monasteries Chorten and Mani. The trail lead you Namche Bazaar via Chaurikharka and Phadking, Monju, Banker and last village of the Jorasalle before Namche Bazaar. Everest Gokyo Chola pass trek will take through delightful settled Sherpa villages, deep valley, Himalaya River and experience world famous Sherpa culture, friendly people and their warm hospitality.You can add other few hiking options for additional side trips in Khumbu high valley of Nepal. Your adventure package includes the crossing over Cho la pass EBC (5,416m) which is the highest pass in the Khumbu region. To cross Cho la pass you have to be mentally prepared because it needs 6 hours of energetic walk and the good physical fitness for adapting in this high altitude. 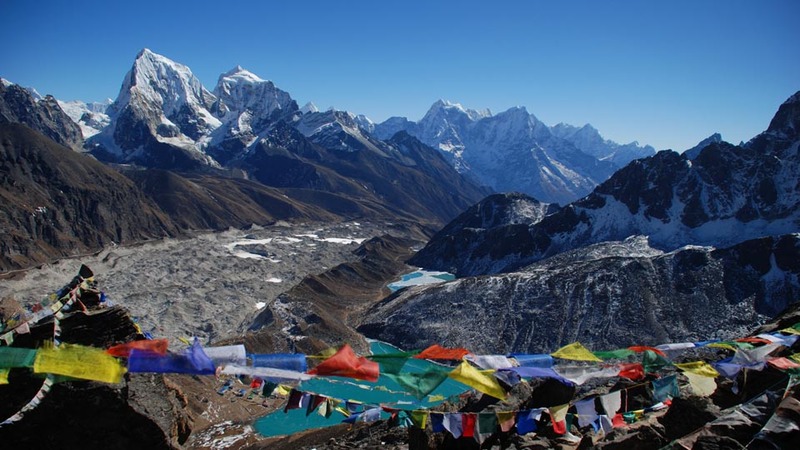 Everest Gokyo Chola pass is very tiring trek gives you the chance to explore the Khumbu valley and around Gokyo lake. Gokyo Chola pass trekking trail extends up to Kalapathar and walk downhill Lukla via Tengboche, Namche and Phadking. Today we fly to Lukla which takes around 25 minutes. Lukla is the entrance point for this trek where we take short break for tea. Then we will continue the journey to Phakding which takes about 4 hours and stay overnight there. Phakding is a small village located at the bank of the Dhudkosi River where we can get sufficient loadges for staying. From here the trail continues to Chhumawa with the beautiful scenery of waterfalls along with the magnificent view of Thamserku himal then crosses a long expansion bridge and gets at Monju and Jorsale where we stop for Lunch. After that we cross thrice the Dudhkosi River and from the last expansion brides the trails ascend till Namche bazaar around 3 hours. If the weather is clear, you can see the Mt.Everest as well while ascending.It takes around 7 hours from Phakding to Namche Bazaar. Today we spend whole day in Namche Bazaar for acclimatization. You can visit Sherpa museum and army camp to see the Everest view along with detail information for flora and fauna that can be found in this region. After that, we come back to the hotel and will spend the time by wandering around Namche Bazaar. The trail passes through the middle of forest and offers the magnificent vista of Cho Oyu (8201m) other snowy peak of Khumbu Himalaya Overnight at teahouse. The whole trail is zigzag. The mountain vista seen from the Gokyo region is captivating. Further two hours climb to Gokyo RI (5350m); a small peak above the lake offers the spectacular panorama of Cho Oyu, Lhotse, Makalu and Cholatse. You can trek to Gokyo Peak which start early in the morning. The summit offers the extravagant vista of Cho You, Everest, Lhotse and Makalu. While climbing down you can enjoy the view of Gokyo Lake. Overnight at teahouse. Initially walk downhill to reach Thangna village and have tea or coffee. The trail here from here goes directly to Cho La Pass at (5414m). Cross Cho La and walk down hill to Dzongla village. Today might be the difficult day in trekking. Overnight at teahouse. After having morning breakfast you will start your trek to Lobuche. On the way you can witness Dzongla Lake, Ama Dablam and Thamserku. Overnight at teahouse. Following the rocky moraine path and watching icy glacial pond and icebergs below the Khumbu glacier a short downhill walk after the last rocky moraine dunes bring us to Gorakshep. Gorakshep is located below Kala Patthar (5545m) and Mt Pumori. Early in the morning climb Kala Patthar and enjoy the spectacular view of sun rising. From Kala Patthar one can see Mt Everest, Mt Pumori, Lingtren, Khumbtse, Nuptse, Lhotse, Ama Dablam, and Thamserku along with many other. Climb downhill have lunch and trek to Pheruche. Pheruche is a small town where all the facilities of communication are available. Here we can find Himalayan Presque Association Aid. Crossing villages, Buddhists monasteries, bridges and some waterfall, today we will trek to Tengboche (3890m).Overnight at Tea house. First part of the trail directly goes through Rhododendron forest and pine forest to Fungethaga. The trail slightly goes uphill to Namche via Trashinga and Sanasa village. Great view of the Khumbu Himalaya from village of Sanasa. Namche is the beautiful city of Everest region from where we descend down to Monju and cross the Dudhkoshi River and gets at Phakding where we spend a night. This is the last day of your trek. We return back to Lukla with great pleasure to celebrate the final day at Lookla. By the evernig we all will get together and celebrate the last day with your innocent porters and guide and stay overnight there. We say good bye to our innocent porters and then fly back to Kathmandu which take around 35 minutes. You have whole day free. On this day you can do shopping and prepare for your final departure. Arrival and departure transportation, Kathmandu/Lukla/Kathmandu flight tickets, 3 nights hotel in Acme Guest House with breakfast, Tims card and Permits, one guide, porters, their foods and insurance, in trekking your accommodation, food( breakfast, lunch and dinner) etc. Personal insurance, rescue flight, personal expenses such as bar bills, tips, any loss arising due to unforeseen circumstances such as accidents, road blocks, landslides, strikes etc. Nepal Summit Trekking (P) Ltd is run and managed by Mr. Chhabi Siwakoti who has been working as Tour Leader and Climber more than 20 years with a German and other European adventure organizations.